Busy, busy day today but a lot got done. Finally finished one section for a job which am pleased with and did some more work on that painting. It's getting there and am a bit happier with it. I haven't done a new A3 fish bone piece for ages and I really need to find time to do some printouts and scanning. Will cost me quite a bit though. Boo. I'll need to do select prints until am more liquid or just sell the originals. I also haven't gone to the gym this week. I may pay for that come Monday. 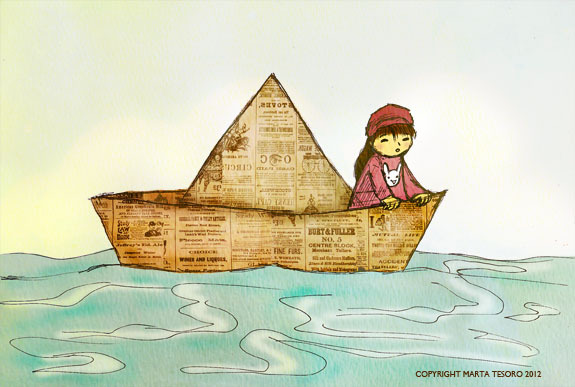 You know, for an artists I've never done a paper boat properly or a paper aeroplane or anything origami actually. I don't think paper folding is one of my skills. I love this image. It it beautiful Your use of colour is in harmony. Happy New Year Marta!!! I'm just re-entering into blogland after a bit of a hiatus!! Many congratulations on your six month daily drawing extravaganza!!! Lifting a glass to you!! I've loved catching up with you and your special creations! !